You set up a referral program because you know that it builds up a customer base and grows customer loyalty. You wanted to make authenticity a vital part of your marketing campaign because you know people trust recommendations from people they know more than any other type of advertising. But also you know that the best way to take advantage of the benefits of referrals is to create a program that takes on a life of its own. You want to build something that customers respond to, something that's the holy grail of any marketing effort — something viral. It takes the perfect storm to make a campaign *truly* viral. Virality is a tricky thing to pin down. It takes the perfect storm to make a campaign truly viral. We'll help you get the foundation you need to build a viral referral program that your customers love and that strengthens your brand. People will do more of something that's easy. And that goes for refer-a-friend too. They certainly don't want to jump through hoops to get referral rewards. You need customers to know that they can always find a way to share, keep it on their minds, and make it easy for them to reap the rewards. Get your referral program front and center. Whether it's a banner on your website, on the homepage of your app, or in your product emails, you need to plug your program. Ideally, you're keeping in the front of your customers' minds whenever and wherever they engage with you. 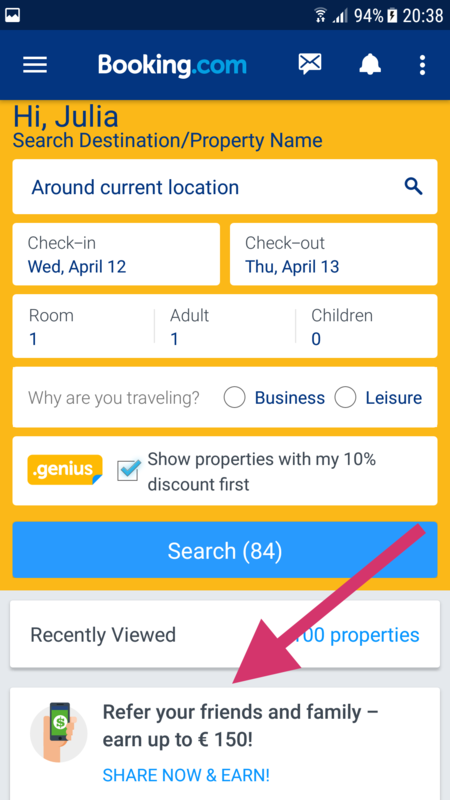 Booking.com places their referral CTA on their website during a customer's booking, reminding them they have an easy way to save on their trip. They also put their CTA front and center on their app. By encouraging people to use your referral program, especially when you're reminding customers that if they help you're brand that they'll get a reward, you'll build a measure of good will. Having people feel good about your brand — you're looking out for them and aren't being pushy about getting them to spend — is the type of thing that gets people to become ambassadors. If customers have a better experience (and the ability to share with friend is a better experience, they're way more likely to spread the word about your brand. Make sharing and referring low-friction. Enabling social sharing is a great way to take the friction out of referring friends. 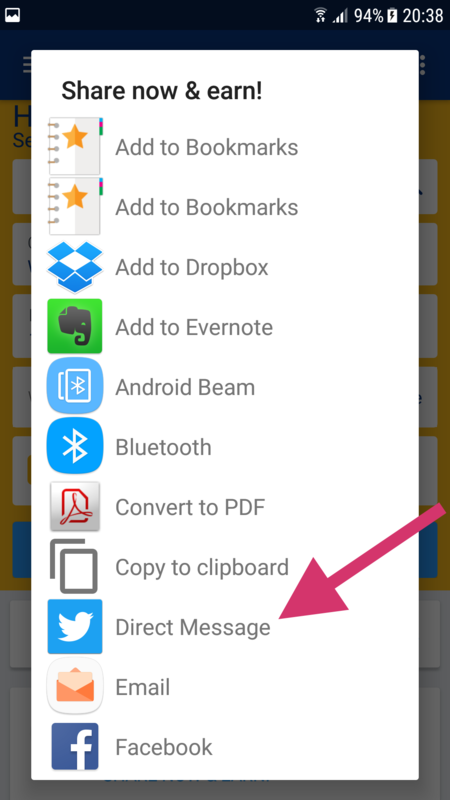 Tweets, Facebook messages, emails and other social shares can — and should — happen without the user having to actively leave and return to your website or app. 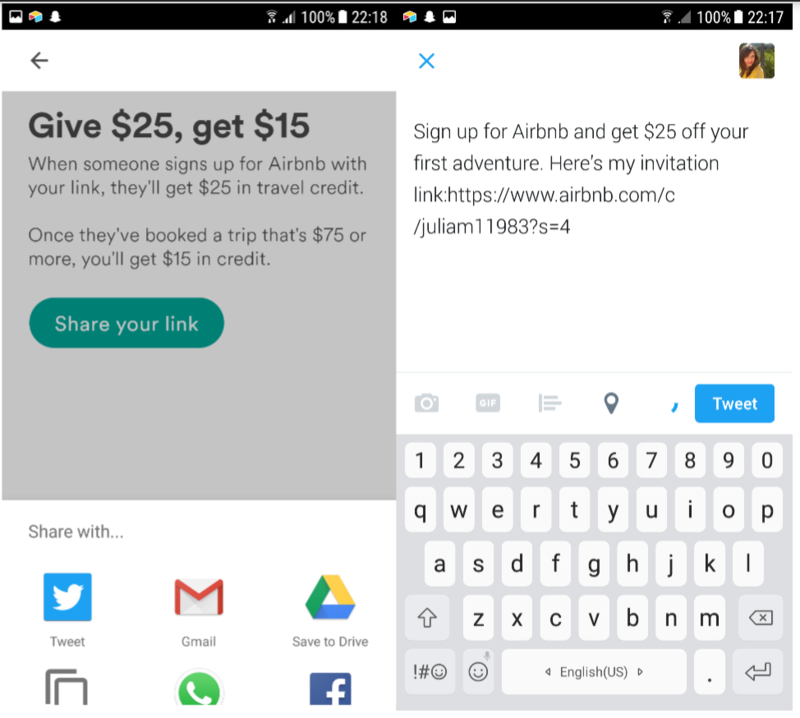 For example, Airbnb lets users choose their social platform and share their referral link without having to leave their app. Airbnb's extensive social sharing options make in-app referrals easy. 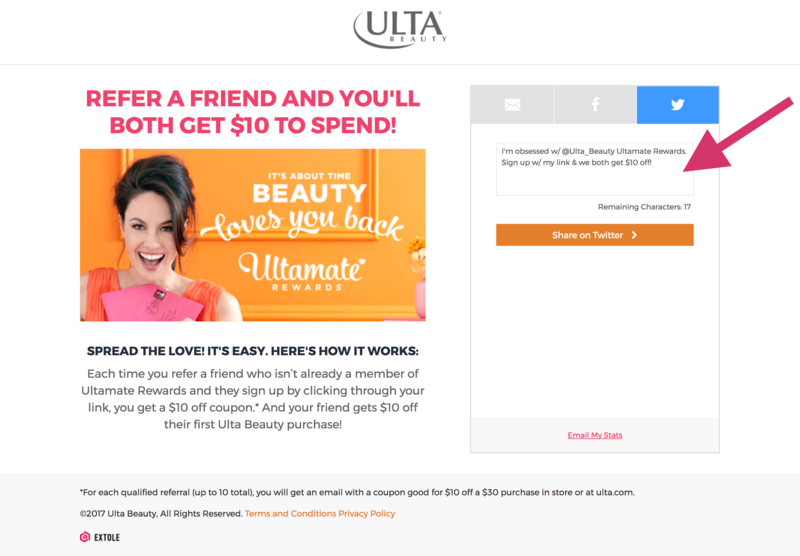 Connecting your referral program to social isn't just easier for customers — it also builds virility into your product. A great example of this is beauty brand Glossier, who dominated social at their product's launch in large part because it was so easy for advocates to turn their friends on to the brand. Though visibility is important, if you want virality you need to add value to the mix. Maybe customers want a dollar amount for discounts, or maybe they need something more product-specific, like more GBs to host their photos. Whatever fits your product and your customers, dig into it and make sure customers know that they're getting real, useable value from you. Uber does this well by labeling their in-app referral program by its reward: free rides. They know you want to ride for less, and they're reminding you of that every time you use your referral link. 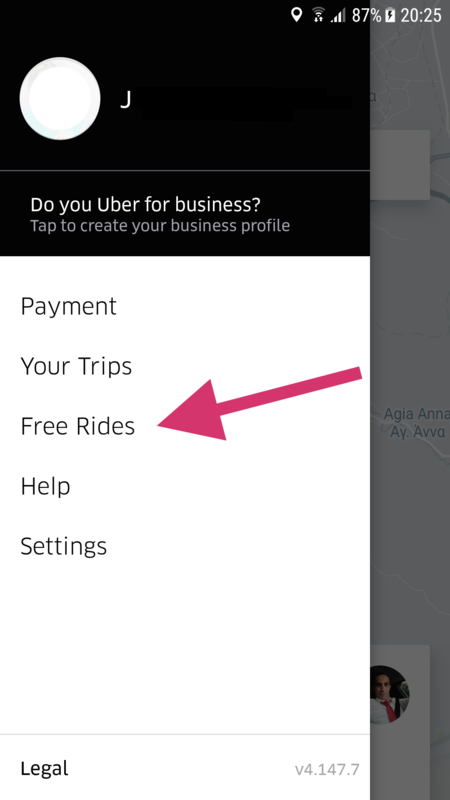 Keeping their “Free Rides” referral program in the main navigation window means it's always on the customer's mind. Having valuable rewards for referral is a two-fold benefit for you as a business. People are more likely to share if the reward is good. If a customer knows they can get a free product, or 50% off, or have my favorite product get thrown in as a bonus on my purchase, the value to them is high. Not only that, but having a good referral program also makes the person they refer more likely to purchase. Trying a new hair color is a lot more tempting when your friend says it's good and you have $15 off. Your customers will feel connected to your brand. When you provide a benefit that customers want, it tells them that you understand them and you want to help them. Building this goodwill not only makes people more likely to share and talk about your product (through referral or otherwise), but it also makes them feel more connected to your company and more likely to re-engage with your brand. Chances are that you genuinely want to help your customers get the most out of your brand and product — that's why you went into business. So share that enthusiasm with them in your referral program! Especially in today's increasingly personalized world, customers don't want to be forced to tweet a canned message or get generic, sales-y emails. For your referral program to take off, you have to make it personal. People want to feel like they're connecting with and helping each other, not like they're hyping up a brand. When people are telling their friends how they really feel about your product in their own words, their friends are more likely to engage with you. Since your referrers are people who actually like your product and have good things to say, let them! Let people share via direct message. The goal of personalization is connecting with your customers. If people feel connected with your brand, they'll be a better ambassador, they'll spend more, and they'll refer more. At this point, we've covered the components that make the groundwork for a viral referral campaign. But only allowing people to refer once or twice puts a short shelf life on your campaign. Instead, you should look at your referral program as a continuous effort that encourages customers — new and returning — to engage with your product. Adding a referral component to your gamified rewards system, or building a gamified feel for your current referral program will encourage people to keep referring. Something as simple as a progress tracker can help people feel more engaged and keep them maximizing the benefits of your program. Remind people they can do it again. After someone gives a referral, thank them for putting in a good word for you, and remind them that they can refer again. Make sure that you're getting a CTA to refer in front of people regularly. 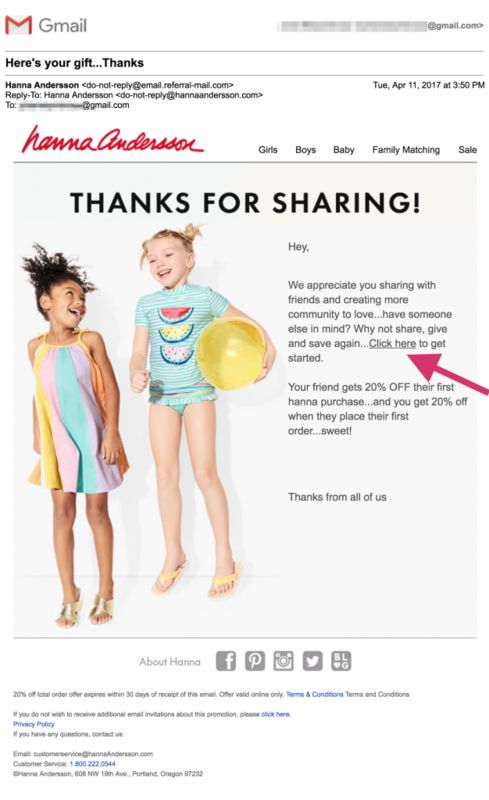 Clothing retailer Hanna Andersson immediately thanks their referrers via email and reminds them they can continue to earn rewards by referring again. Don't hide your referral program once people have signed up for it or started to use it. Remind people that it's there and keep it easily accessible on your website and in your app. Making your program repeatable is the last step because kicking in that reoccurring action is really just capitalizing on what you built — something valuable, that encourages users to connect others with your brand and is easy to use makes people want to repeat it. The virility of your referral campaign is going to depend on more than what we've talked about here. You need to understand your user base and your social channels, have an on-brand message and discover what rewards are valuable for your customers. But we do know that you can't make a viral campaign without the groundwork laid above. You can encourage virility with well-designed referral programs. And, even if those campaigns or programs don't immediately become viral, they'll still be forging valuable connections with new and returning customers.